Previously: GFW Global Champion Eli Drake defeated Johnny Impact to retain his title. 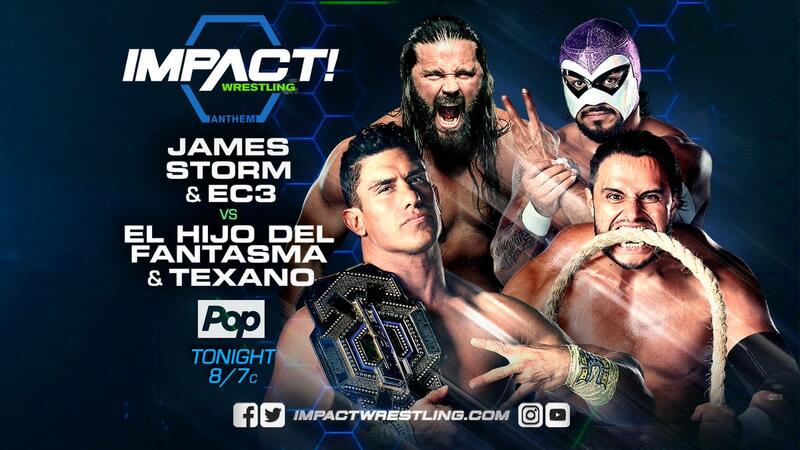 Tonight: James Storm & Ethan Carter III take on El Hijo Del Fantasma & Texano. - An in memoriam graphic paying tribute to Lance Russell aired. It was followed by a "Pray for Vegas" graphic. - Eli Drake and Chris Adonis came down to the ring to open the episode. Drake bragged about beating Johnny Impact last week and revealed that Impact isn’t at the show. He took off his jacket and gave it his finisher -- The Gravy Train. Drake got Adonis a match tonight against Garza Jr. Adonis wasn’t happy about the surprise match. Drake joined the commentary team for the match and Adonis dominated the action early on. Garza was able to hit a hurricanrana, but he missed an attempt at a plancha. Backstage, Johnny Impact arrived at the Impact Zone. Drake ran off from the commentary booth. In the ring, Garza made a comeback and scored a close near fall. Impact ran in and attacked Adonis for the disqualification, while Drake and Garza ended up brawling. Jim Cornette then ran out and made a match between Impact and Garza for next week, with the winner getting a Global Championship title shot at Bound for Glory. - Moose was on the phone and searching for Bobby Lashley. He arrived at the American Top Team gym and told the person on the phone he didn’t need their help. - At the LAX Clubhouse, Konnan was irate that Santana and Ortiz lost the belts last week. This erupted into a heated argument. OVE dominated the match and picked up the easy win with a version of Total Elimination. - Knockouts Champion Sienna and KM came down to the ring. Sienna was upset that she doesn’t have a title defense at Bound for Glory. She thinks it’s because she defeated all the women and will have to start fighting men soon. She then assumed she knows what Impact Wrestling has planned and announced that she’s the newest inductee into the Hall of Fame. This brought out Gail Kim, who demanded a championship match at BFG. Taryn Terrell came down to the ring and pointed out that Kim has never defeated her. Terrell challenged Kim, which brought out Allie. She wanted a title shot too, and out came Karen Jarrett. She announced Sienna defending against Kim, Terrell, and Allie at Bound for Glory. - Joseph Park organized a very successful autograph signing for Grado where he charged $100 per autograph. Everett and Lee were partners here despite being bitter rivals not long ago. The heels were in firm control, but the faces made a comeback by hitting suicide dives to the floor. The faces cut off Konley from his corner and worked him over, then Everett kneed Dutt in the back and the heels took over. The heels isolated Dutt in their corner until Williams got the hot tag and ran wild. Sydal caught Everett with a hurricanrana and hit the shooting star press for the win. After the match, Dutt, Williams, and Sydal all demanded an X Division title shot at Bound for Glory. - Moose entered the American Top Team gym. He shoved Dan Lambert, then ATT jumped Moose and beat him down in the Octagon. ATT threw Moose out of the gym. Early on, Storm and EC3 weren’t working well together. Fantasma caught Storm from behind and the AAA team took over. EC3 and Storm finally worked together and briefly gained the advantage, but the heels took back control by isolating EC3. Pagano made his way to ringside, which distracted Storm as EC3 tried to make the tag. Fantasma missed a big splash and Storm got the hot tag. Storm ran wild and scored a very close near fall on Fantasma. Pagano distracted Storm as AAA regained control. Storm tried to suplex Fantasma into the ring, but Pagano grabbed Storm's legs and enabled Fantasma to score the win. - At the LAX clubhouse, they made up after their earlier argument. They will challenge OVE to a 5150 street fight at Bound for Glory. Next Week: Johnny Impact vs. Garza Jr. with the winner getting a GFW Global Championship title shot at Bound for Glory.